A package ordered days or weeks ago finally arrives on your doorstep. Too bad you weren’t home to actually receive it. In the industry this is known as the last mile, or the actual fulfillment of an order placed online or via some other portal for ultimate delivery. Unsurprisingly, last mile is extremely important to customer satisfaction; it’s the realization of the promise made by the point of purchase. Meet or exceed expectations via beating expected delivery time, careful and attentive packaging, or other perk and your customers will remember your brand in the most positive light, increasing their chances of shopping again or passing on a referral. Violate these expectations and not only have you likely lost a customer, but you may also find yourself issuing refunds and apologies and putting yourself into the red. In most of North America, Amazon is the set standard to meet or beat in not only online customer experience, but in their incredible ability to fulfill orders anywhere from a few hours to a couple of days with their Prime service. But my recent experience with two items ordered from Amazon Prime challenged not only their abilities in last mile fulfillment, but exposed some holes in their customer experience that likely stem from their exponential growth. Yes, ladies, gentlemen, and folks of all kind: even Amazon can screw up the last mile. And yes, it ended up costing them as a result of the poor customer experience I had. Here’s the tale of how I unintentionally pushed the bounds of Amazon Prime fulfillment… and how they let me down. I’ve been an Amazon Prime Member since February 12, 2016. I guess that makes me an earlier adopter than most; Prime only launched in Canada in 2013 so I was only a few years behind the curve. An occasional shopper on the ecommerce marketplace before I joined the club of ‘why don’t we just Prime it?‘, Amazon cleverly lured me into the program with a free trial. And I haven’t looked back since. Most of my experiences with Prime have been pleasant ones, holding true to the high benchmark Amazon continually strives to set in all they do. In the past, I’ve experimented with 2-hour delivery only to see a clearly privately-owned vehicle pull up in front of my house and a non-Amazon or fulfillment company employee to hand me my package (a decidedly neat and interesting experience for me). I’ve sent gift-wrapped packages to friends and family where I never laid my hands on the items I purchased. One year, Prime served as my Santa Claus stand-in. And I’ve challenged the bounds of what can be delivered. I’ve ordered consumer goods, electronics, food (although no fresh grocery… yet), clothing, tools, hardware… you name it. I’m a very seasoned online shopper — just ask my credit card. And it’s not a characteristic of my cohort, nor of my lack of desire to go out into the world and into a physical store to buy these things. Like many, my Prime shopping habits are a combination of convenience and an inability to find the items I need in store easily. I needed a 128 oz jug of cleaning liquid, and… a 65″ 4K Ultra HD Smart QLED TV. Now, I can feel your side-eye from here: a TV from Prime? I had very good reasons for ordering both items on Prime. The cleaning liquid was a refill of a specialty product that was only available in certain stores. The original bottle was given to me by a tradesperson who had done some work on our house, and I subsequently fell in love with it. When it ran out, I discovered that the closest store where I could buy it was a full two cities away from where I live. So, Prime it was. Without a second thought, I placed my orders for both items on the same day: July 29. Both were Prime orders, both were guaranteed 2-day delivery, and both (oddly enough) required a signature at the door for delivery. Informed by my past positive experiences with Amazon Prime, I thought no more of my orders… until a few days later. And that’s where things started to fall apart. Before I realized, a full week had passed. No deliveries. I did the only thing that most consumers can do in this situation: tried to be patient, and fervently watched the order progress bar and my inbox for any updates. The cleaning liquid just appeared to be moving slowly. Now, I come with more understanding and sympathy for these admittedly unusual orders and what it takes to deliver liquids and large, heavy items, given what VL OMNI does. I wasn’t too worried about the cleaning liquid; it would arrive when it would arrive, and I know from past experience that sometimes the 2-day delivery promise doesn’t always work out that way for whatever reason. So long as it arrived eventually and I still had tracking visibility on it, I would be more or less happy. But the TV was a bit more concerning. It was a far more expensive purchase, and we were honestly excited for it to arrive. The order notifications I was receiving both in email and on my Amazon Prime portal were legitimately causing concern. Multiple times I was made aware that the ship date was confirmed, only to be subsequently notified that the date was pushed back. This happened at least three times. So much for the 2-day promise. There is an interesting additional element I should add in at this point: I just so happen to live in a city with 8 Amazon warehouses. With my industry-insider knowledge, I know that these warehouses are a combination of FBA and Prime warehouses. But the song and dance in my last mile delivery up to this point started to make me think that both these items were either Seller Fulfilled Prime, or else the fulfillment was being completed by a third party as a part of the FBA structure. But let’s be honest here for a second: I’m not your average Prime customer. Most customers simply don’t care about this level of detail or, frankly, how their stuff gets to their door, so long as it gets there when and how they expect it to. I’m likely far more patient and understanding when compared to your average Prime shopper. 10 days in to my 2-day delivery, it was now time to up the ante with Prime. I made my peace with the cleaning liquid, and focused my energy on the TV. It was a higher value item, and my customer experience was already offset with the delay combined with the confusing notifications. I was starting to regret my online order; after all, I could have simply walked over to Best Buy and had them price match Amazon’s listed price. But the scientist in me took over, and I dug in deeper. I actually called Amazon Prime. This is something I’ve only done one other time. It takes a lot for a customer to reach the point where they feel the need to reach out to actually speak with a marketplace or e-tailer; some of us specifically shop online to avoid the human interaction. And I’m also not one to complain; again, I know how complicated ecommerce and multichannel commerce can get, and have a lot of sympathy and understanding as a result. We took the opportunity to also discuss how the TV was going to be delivered. Both my partner and I work long daytime hours; no one is home at least 5 days a week to receive packages. In the past year, our Prime orders have been dumped on our stoop via a third-party fulfillment company that also emails a digital picture confirming the delivery of the package at my house, which is both convenient and reassuring. I also have several cameras on the exterior of my home that I can access via my smartphone. Worst case scenario is that if something gets snatched, the liability is on the last mile fulfillment and not me — and especially true for items that require a signature upon delivery. Unsurprisingly, the TV was a signature-required delivery. We brought up the fact that we likely won’t be home during the day when the TV was (finally) going to be delivered — a full 10 days after my initial order placement, by the way — with the Amazon representative over the phone. We asked if it could possibly be delivered in the evening when we would be home, letting them know that having to wait another 24 hours to pick up packages from fulfillment centers is extremely inconvenient should we not be home to sign. She said she would see what she could do, which I understood as perhaps Amazon was going to work their customer service magic and have the TV delivered in the evening. August 7th rolled around: both the TV and the cleaning liquid were due to arrive. There was no estimated delivery time (which seems to be a perk that only certain 3PLs offer). Murphy’s Law saw to it that on that day, a work day (of course), I was going to be in quite a few meetings and would not have access to my personal phone and hence the delivery notification emails from Amazon and their fulfillment provider for my last mile delivery. I had been lulled into a false sense of confidence and security with the TV, having spoken to Amazon a couple days earlier, and having past experiences with Amazon customer service promises always ringing true. Plus, they had issued that refund, a sure gesture of good-will and favour from the delivery gods… right? Wrong. It was almost 4 PM by the time I got to my phone. To my horror, I had several delivery notices from the fulfillment provider, who, as per their usual, had sent me photos of my house number and my packages on my front step to confirm my delivery. The TV and the cleaning liquid — both which required signatures as clearly outlined in my order history on Amazon — were sitting on my front step. Open and exposed to the neighborhood and the elements, and anyone who cared to meander down my street. My stomach hit the floor. I looked at the timestamp on the emails, and both items had already been sitting on my step for at least an hour. I quickly turned to my home security app on my phone to see if I was going to come home to anything — there had been a rash of delivery scams in my neighborhood — and thankfully my live view showed both packages sitting there, albeit unattended. I didn’t know what to do. No one was available for me to call and have them, what, sit on my step and babysit my items for the 2 more hours when I’d finally be home? I desperately tried calling a couple shot-in-the-dark contacts for help or at least advice, but to no avail. So I did the only thing I could do in that situation: I set up my live-camera view of my front door on my phone to keep a constant eye on the TV. I ultimately ended up leaving work early. And like a good millennial, I carpool, so this also meant my colleague had to leave early. Thankfully, the TV and all other items were accounted for by the time I arrived. I also thanked my lucky stars that this particular afternoon just so happened to be one of the few days it did not rain, as the TV was not fully covered by the veranda. Remember the cleaning liquid? Well, it looked like someone had violently chucked it at the threshold to my front door. The box was deformed, upside-down… and wet. Of course, I didn’t notice that the box was also actively leaking until I had carried it through my house (good thing it was a cleaning product?) and opened the actual box. Despite the Amazon seller having carefully padded the 128 oz bottle with bubble wrap, cellophane wrapping the actual bottle, and adding extra tape around the lid to keep the good stuff in, all of these precautions did nothing to protect from the damage that was inflicted on the bottle. 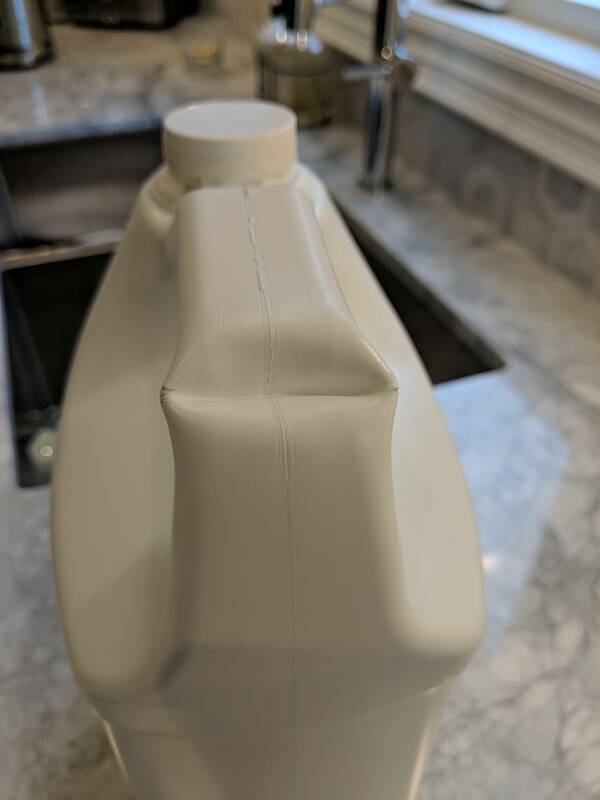 The handle was indented and on closer inspection, the inflection points on the plastic from the dent had created holes. Mystery leak discovered. In the interests of bringing this issue up to the retailer and Amazon (and honestly not to complain; I genuinely want to let these retailers know when things go off in my experience so that they can improve for the next person), I reached out to the seller and sent a couple of pictures of the bottle as proof. And to my genuine surprise, they issued a full refund. This is definitely a rare negative customer experience story for Amazon, and especially for Prime. Their customer experience is well-known for the high standard it sets for their sellers, never mind other ecommerce and multichannel retailers. But no one’s perfect, and we’re all navigating the complex and rapid changes in commerce across all channels these days. Speaking from our expertise in working with many complex and growing merchants for 25 years and having seen this scenario play out on behalf of our customers with Amazon and many other sales channels (including their own), there are likely two things going on here. First, it’s no secret that Amazon is undergoing some incredible growth, and with that comes complexity. With more complexity comes heavier requirements on systems and how they communicate with each other. If my intuition and experience is correct on my two items being Seller Prime Fulfilled, then there’s a disconnect between Amazon and the seller’s ability to fulfill at a certain standard at the very least. In other words, Amazon is growing so quickly that they are having difficulty enforcing their own standards across all levels of Sellers, and things are slipping as a result. By way of admitting their errors, I received not one, but two refunds — one partial, and one full. This ultimately hurts not Amazon (are they worth $1 trillion, yet? ), but the retailer. If these penalties weren’t paid from the get-go by the Sellers, they’ll likely show up soon enough as charge-backs. And if my items were instead third-party fulfilled FBA, you can bet that Amazon’s not footing that charge-back bill, either. Second, Amazon is clearly adding more third parties to manage the consumer demand driving Amazon Prime’s growth. A year ago, Prime was delivered to my house by a veritable hodgepodge of fulfillment services and 3PLs. These days, it’s almost exclusively this single fulfillment provider — the one who sends picture confirmations of their deliveries. But in adding more partners to help with the workload, standards are slipping here as well. A simple signature was required, or else the packages should have been taken back to the fulfillment center. Instead, they were left, signature be damned. But not to fret: growing pains are to be expected, and these speed-bumps can (and will, in the case of Amazon — I’d put money on it) be ironed out. Ultimately, visibility — both on the customer side and Amazon’s controller side of this story — clearly needs to be improved. This can be easily improved with better data integration, connecting applications, partners, and of course Amazon Sellers into Amazon’s systems better and tighter so that Amazon can have better control over their empire while maintaining their customer experience standards. In fact, had data integration and connecting applications, partners, and Sellers into Amazon in a way that’s not only meaningful to all parties, but that is also elastic and allows for changes and adjustments, my story may never have happened. That’s the power of great data integration: if done right, you’ll never even know it’s there. It just works. As a customer, my experience during last mile delivery was negatively impacted by misleading delivery guarantees, confusing notifications, and a betrayal of the promise made by Amazon in requiring a signature upon delivery that was carelessly bypassed. This cost me time (in pursuing what had happened), it cost Amazon a bit of credibility in my customer experience, and it cost the Sellers — literally — via volunteering a partial and a complete refund on my items to keep me happy (and likely to keep me off the message boards; sorry guys, I wrote an editorial article instead). The moral of the story is that even the big guys make mistakes — or, that there’s always room for improvement. Conversely, this tale also shows that Amazon is not the untouchable demigod of ecommerce, either. If they’re making missteps like those made with me, then that presents a competitive advantage to other marketplaces and ecommerce sites that can provide better last mile delivery and an overall better customer experience as a result. So merchants, learn from this tale and capitalize on Amazon’s learning curve at my expense. Don’t underestimate the power and importance of your data integration strategy to your customer experience from start to finish… otherwise it may surprise you in unpleasant ways.